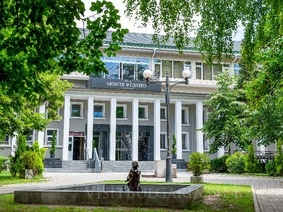 Location: Monte Cristo hotel is located in the center of Blagoevgrad, only 1 hour by car from Sofia, 1 hour from Greece and just 25 minutes from the Macedonian border. The hotel arises as a result of reconstruction and renovation of the Public Mineral Bath which is still functioning and welcomes visitors next door. The hotel has an exquisite design, impeccable service and great amenities. Accommodation: The hotel features 44 standard rooms, 6 deluxe rooms and 4 one-bedroom apartments. Standard room - 25 sq.m, Deluxe room - 35 sq.m, One-bedroom apartment /42 sq. m, bedroom with king size bed, Living room with sofas). The rooms are equipped with Double bed /possibility of separation/, 32 inch TV, Mini bar, Individually controlled air condition / Central air conditioning, Wireless internet connection, Direct telephone line, Bathroom with shower and hairdryer, Safe box. Non Smoking rooms.